Posh man-of-the-match Paul Taylor in action against Oxford. Photo: Joe Dent/theposh.com. Paul Taylor stood tall as Peterborough United were again cut down to size by League One opponents at the ABAX Stadium today (March 11). 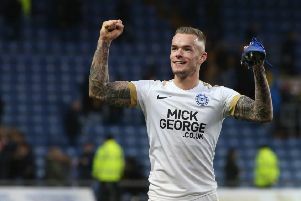 Taylor played at the tip of a midfield diamond and sprayed numerous excellent passes around, but Posh still went down 2-1 to Oxford United. Michael Bostwick of Posh holds off Oxford's Kane Hemmings. Photo: Joe Dent/theposh.com. Posh skipper Chris Forrester sent this shot wide of the Oxford goal. Photo: Joe Dent/theposh.com.